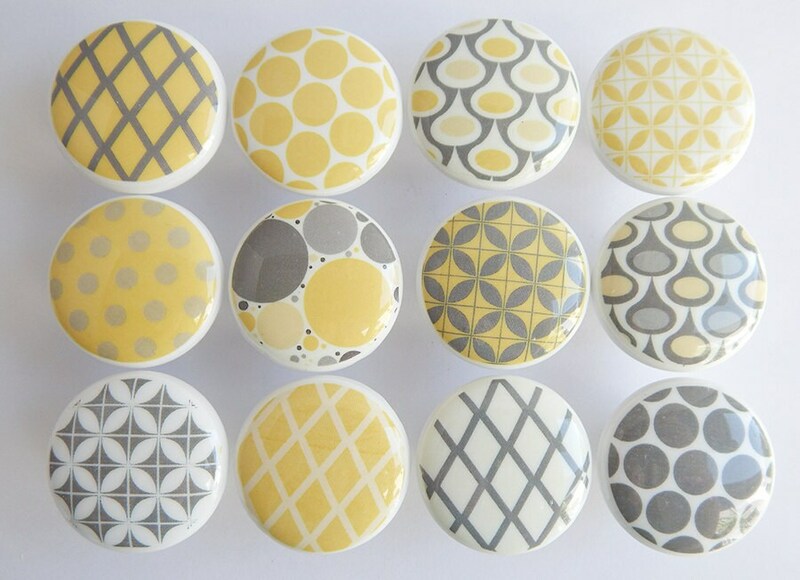 A beautiful assortment of pattern knobs in yellow and gray. These are beautiful white ceramic knobs with extra durable hard resin tops. You may order the set of 12 as shown or order them individually. Please list your design choices in the 'Note to leilasloft' box at checkout. MADE-TO-ORDER- CURRENT TURNAROUND TIME IS 3-4WEEKS. * I have screws from 1/8" - 3" available. If you need a different length than the standard 1", I would be happy to supply that. Please leave me a note. A good way to know which size you'll need is to measure the screws that are currently on the dresser. Very well made little knobs, hard to choose from all the great patterns, thank you!! Returns are accepted within 45 days. Items must be returned in their original, new, condition. I offer full refunds that includes the shipping you were charged. Buyer is, however, responsible for return postage and any customs fees. Please send your return with Delivery Confirmation. Refunds are granted when the item is received. *Please let me know within 7 days if your item arrives damaged or wrong item is received. You are not responsible for return postage if you have received damaged or wrong items. ::::CUSTOM ORDERS & PERSONALIZED ORDERS:::: I can not accept returns on custom orders or personalized orders. Thank you for your understanding. MADE-TO-ORDER- CURRENT TURNAROUND TIME IS 4-5 WEEKS. My turnaround time is usually 3-6 weeks. Please check my shop announcement to see current turnaround times. Your patience is very much appreciated!! Thank you in advance! I am able to accept only a few rush orders. Please contact me before ordering, if you need your order sooner than my current turnaround time. All orders are shipped through the USPS. I ship via USPS First Class Mail International which does NOT provide tracking unfortunately. Buyer is responsible for all taxes, tariffs, or duties that may be collected by customs. Buyer is also responsible for any additional charges that your local carrier may charge. Because of customs, please allow 4-8 weeks from the shipping date for your order to arrive. My knobs are made to order. My processing time is usually 4-6 weeks. Please check any of the listings or my shop announcement for current times.